The Rose City Classic is dedicated to providing exhibitors with the best show environment possible. We work year-round to assure a safe and serviceable environment for the comfort of our exhibitors and the welfare of their dogs. The superintendent for the Rose City Class Series of Dog Shows is Jack Onofrio Dog Shows. Please visit their website to enter online or to get more information. Their Oklahoma City phone number is 405-427-8181. The Rose City Classic spans 5 days (January 16-2019) starting with 20 specialties and group shows on Wednesday, followed by 4 days of all-breed shows featuring conformation (breed judging), obedience, Rally, and agility. RCC hosts a total of 30 specialties and group shows, (most on Wednesday), and numerous supported entries within the all-breed shows. Special events include CGC Tests on Friday and Sunday, Trick Dogs on Saturday and Sunday and health clinics throughout the weekend. Please note the early entry closing date, January 2, 2019, for our upcoming shows. The Rose City Classic Meet-the-Breeds Showcase is a fun and exciting opportunity for breed clubs and fanciers to introduce their breeds to the public. It’s one of the few chances responsible hobby breeders have to provide local families with good information and a hands-on experience with their breed. Meet the Breeds will be offered on Friday, Saturday, and Sunday. 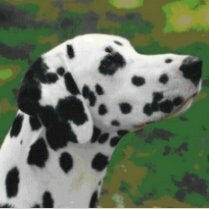 In previous years more than 70 breed clubs have participated and we’re expecting more this year. If your club would like to participate, please contact our Meet the Breeds Coordinator, Linda Bell, at your earliest convenience so that she can reserve your spot. When the schedule is done we will distribute it to the public and publish it. Check back to see the final schedule here on about January 10, 2019, about a week before the show. 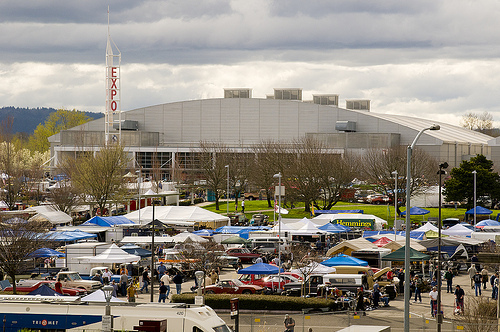 All parking is a privilege extended by the show-giving clubs & the Portland Exposition Center. They reserve the right to withdraw this privilege from any person or persons who uses abusive language, argues with parking personnel or attempts to circumvent the rules & regulations. All parking is at your own risk. The show-giving clubs & the EXPO Center assume no responsibility or liability for damages or loss to any vehicle or its cargo. Everyone using this facility is expected to keep & leave the area clean. Limited handicap parking (with a valid permit) is available for both the general & reserved parking areas. These spaces will have easy access but may be some distance from the show rings. All overnight parking units must be self-contained. No dumping of gray water or sewage. There will be no access to ANY building from 11:00 pm until 6:00 am. All vehicles must vacate the premises no later than one hour following Best in Show Sunday, January 20, 2019. No overnight parking on Sunday, January 20, 2019. A supervised loading & unloading area close to the grooming area (east side) will be available. No exhibitor loading & unloading will be allowed on the west side (North Force entrance) of the grooming area without previous arrangements with the parking contractor. A 20-minute time limit per vehicle will be observed to give as many exhibitors as possible access to this area. Unloading will begin at 4:00 pm on Tuesday, January 15, 2019. Please refer to the grooming information provided in the premium list for further information on access times. General parking is available daily. Enter from the main gate only. Parking for one attendee vehicle is $10.00. Note: The Portland Expo no longer offers a special rate for carpools. The exhibitor parking rate is $8. per day, per vehicle. Enter from the main gate only. Cars parked along North Force Ave &/or North Expo Rd will be ticketed and towed. Follow the signs to loading and unloading. Then return to the general parking area. Reservations close January 2, 2019, or when all spaces are filled. There will be no refunds after closing date. 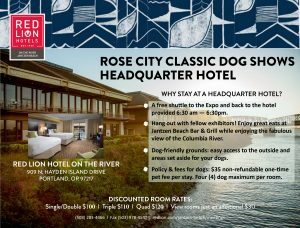 After the Rose City Classic series of dog shows has begun, pre-payment for reservations will no longer be an option and must be arranged in person at the show itself. Fill in the rest of the information requested (again leave blank the box for the license number and state). Then on the PayPal payment form in the box for “Instructions to Merchant” put your actual address and postal code. Remember that these parking improvements are complemented by our headquarters hotel, the Red Lion Hotel on the River (503-283-4466). They have excellent room rates & offer direct shuttle service for exhibitors, dogs, crates, and equipment between the hotel and the Expo every day! Our headquarters hotel, the Red Lion Hotel on the River is ideal for RCC exhibitors and comes with special amenities. A full-scale tour bus has been arranged to carry RCC exhibitors and their dogs between our headquarters hotel, Red Lion Hotel on the River and the show site. Click here to book a room at our headquarters hotel. 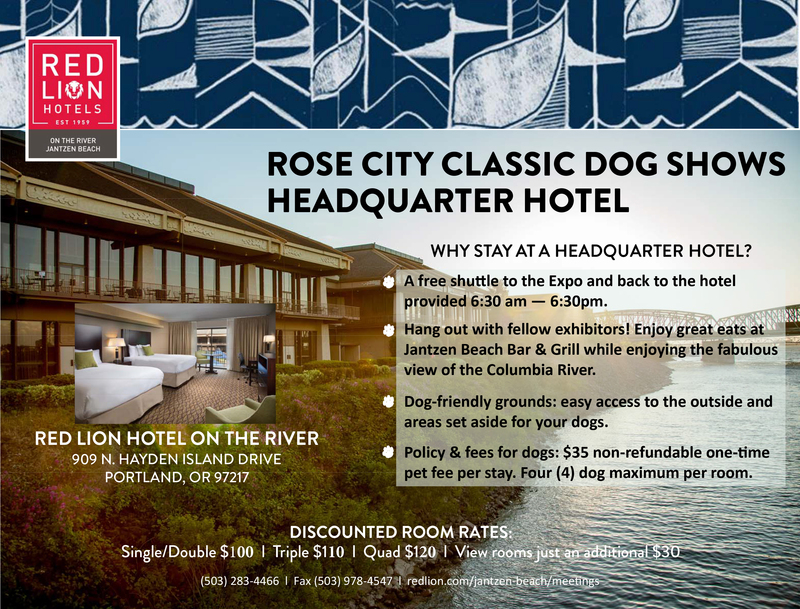 If you call instead of clicking, Be sure to tell them that you are with the Rose City Classic Dog Shows when you make your reservation to get the negotiated rate. 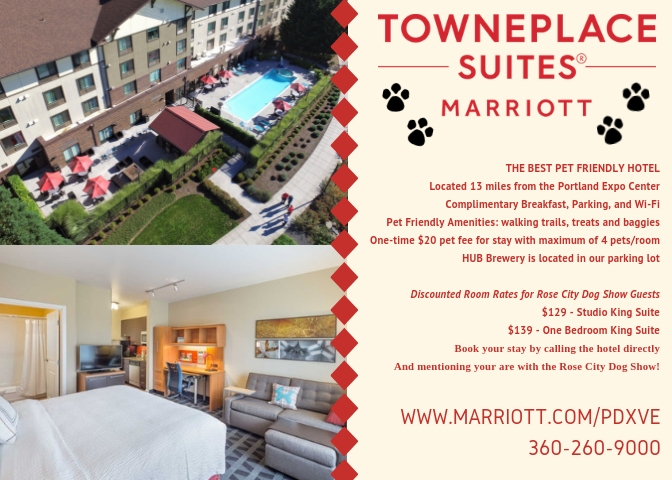 Another great hotel for exhibitors attending the Rose City Classic is the TownePlace Suites by Marriott. This hotel is just 13 miles from the Expo Center and has many amenities for exhibitors and their dogs, low pet fees, walking trails, and a complimentary breakfast. Check it out! Rose City Classic has negotiated a special discount for our exhibitors and others visiting the Rose City Classic. Alaska Airlines, the airline that charges only $100 each way to fly your dog, is offering RCC passengers a 7% discount off of their lowest published fares for trips between Jan 11 and Jan 25, 2019. That discount can amount to a savings of $40 – $80 for each passenger. The Meeting Fare Code is ECMZ947 for 2019. In order to use the discount code without a fee, you must reserve your ticket online: http://www.alaskaair.com placing the code in the box provided. If you sign up by phone there is a $15 charge. Save parking fees at the Expo: take the free exhibitor shuttle for you and your dogs! between the host hotel, the Red Lion Hotel on the River and show site from 6:30 to 10:00 am and from 3:00 pm to 6:30 pm or close of the show. Rental cars and Taxi services are available at the airport. If you call Uber or Lift at the airport, be sure to ask for a vehicle that carries dogs. Driving directions to the show can be found in the premium list or Click here and then click on directions for a map. The public will have an opportunity to “Meet the Breeds” on Friday, Saturday and Sunday, with info posted here.